3 January 12 Is Your Weight Goal SMART? Happy New Year, Everyone ! A New Year means a New Year's Resolution for many of us. If you struggle with meeting the same weight goal year after year, then it is time to rethink how you set your goal. Start the New Year off on the right foot by setting a SMART weight goal. That is, set a weight goal that is S pecific, M easurable, A ttainable, R elevant/Realistic, and T ime-Bound. Since MyNetDiary is a calories tracker that requires a specific target weight and target date to work, the "Specific" and "Time-Bound" parts of a SMART goal are addressed. The "Measurable" part is also covered since body weight is easily measured by a scale. Where people get into trouble is the "Attainable" and "Relevant/Realistic" parts of their goal. First of all, your weight loss goal has to be possible to achieve. Losing 10 lbs in 10 days is not an attainable goal for most people. It takes a deficit of 3500 calories to lose 1 lb of body weight yet the body still requires an amount of fuel to sustain basic metabolic functions (BMR). That is, you can't create too large of a calories deficit without compromising your body's ability to sustain basal metabolic functions. An average weekly rate of weight loss that is safe for most people is 1-2 lbs/week. However, if you are very close to your goal weight, and/or are not burning calories from exercise, then a lower rate of weight loss might be more appropriate for you. Perhaps a 1-2 lbs weight loss per month is a better goal. I typically recommend that a target weight and date be adjusted so that the target calories do not dip below one's BMR. You can see your estimated BMR in the Details tab of MyNetDiary web or in My Plan in MyNetDiary mobile apps . Even if it is technically possible to lose the weight you have set for yourself, the target weight still needs to be realistic and relevant given your life. For instance, if you work long hours in a sedentary occupation and have a long sedentary commute, then you are going to find it very difficult to make time to burn a lot of calories through exercise. In that case, it is not smart to create a goal that requires you to burn 1000 calories every day from exercise to meet the needed calories deficit to reach your stated target weight by your target date. Instead, choose a goal that requires a lower calories deficit. For instance, a 125-250 calories deficit per day results in a 1-2 lb weight loss per month. This calories deficit is possible with a simple 30 minute walk per day (even if the 30 minutes is accrued in 10 minute chunks of time). Another example of an unrealistic goal is the complete switch from dining out to consuming foods made from scratch. If you are a busy person who currently relies on dining out, then you are going to have to set multiple goals to make the time to shop, cook, and organize your new eating life. A more realistic short term goal is to reduce the frequency of dining out for specific meals. For instance, instead of dining out for lunch 5 days a week, plan to dine out only 1-2 days a week and bring lunch from home on the other days. Have a short-term weight goal as well as a long term goal, but enter your short term goal in MyNetDiary. 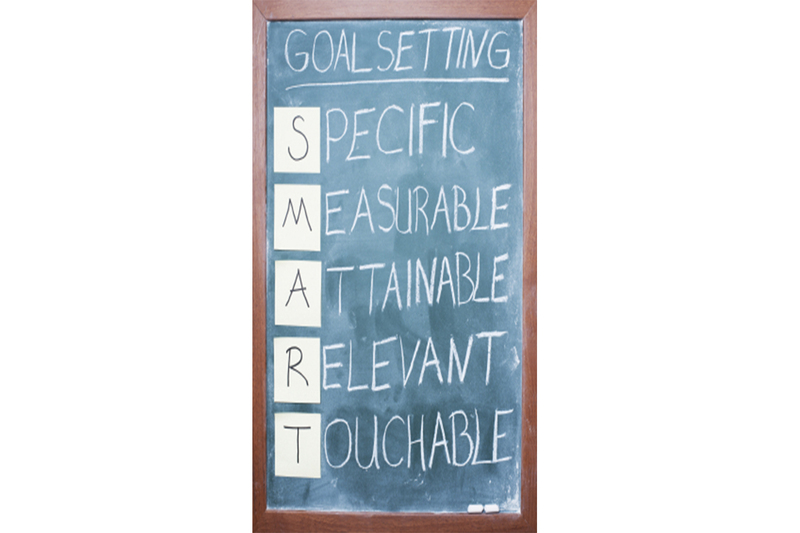 I recommend that you use a step-by-step approach to goal setting. If you have a lot of weight to lose, then start by setting a goal to lose 10% of your body weight (0.10 x body weight). Once you reach that goal, CONGRATULATE yourself since that weight loss is a critical milestone. Even if you never lose a single pound thereafter, you will reap permanent health benefits from losing that amount of weight if you can keep it off. For longer term goals, the time frame could be years. Be patient. The goal is to lose weight and keep it off, not just to lose it. For instance, if I needed to lose 150 lbs, I would expect that this goal would take me about 11/2 - 3 years if I lose an average of 1-2 lbs/week. I would set a series of shorter-term SMART goals in order to achieve that ultimate long term weight goal.